Last week, a 14-year old Texas boy named Ahmed Mohamed was taken from his school in handcuffs to a youth detention center. 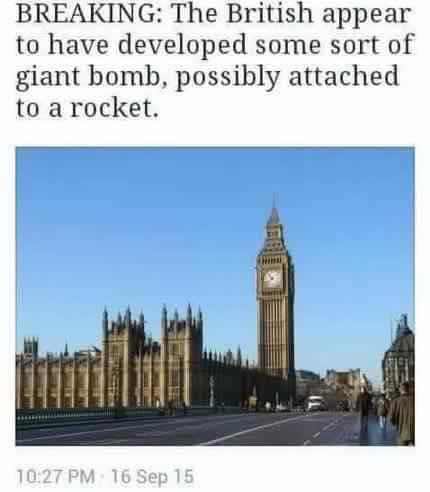 This had been preceded by the administrators at his school mistaking a clock that he had made at home for a bomb. The charges against him were later dropped and Ahmed received support from various individuals and organizations after a social media outcry that reached the top echelons of power. Although the incident and the school’s reaction have been associated with the words ‘bizarre’ and ‘ridiculous’, it is necessary for The Update to explore and understand the underlying reasons behind the incident, besides a blatant lack of discernment in certain individuals. The incident is not the first and certainly not the last of its nature. The roots of what happened can be traced to a number of reasons which include security concerns in US schools, promotion of education and racial discrimination. However the most alarming if not significant part of the problem is racial profiling which poses a grave problem, mostly because those employing it deny its existence. Racial profiling or ethnic profiling refers to the act of suspecting or targeting a person of a certain race based on a stereotype about their race. 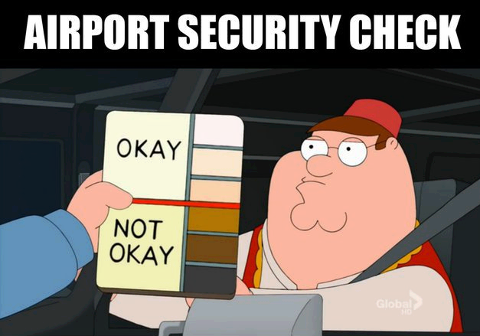 Racial profiling occurs in casual social interactions such as when African-American people are looked upon as ‘shoplifters’ or ‘loiterers’ in exclusive stores, it also takes place in a more systematic way in airports and transport systems where Arab-looking individuals are at a greater risk of being stopped and frisked than other groups. It occurs every day, in cities and towns across the country, when law enforcement and private security target people of color for humiliating and often frightening detentions, interrogations, and searches without evidence of criminal activity and based on perceived race, ethnicity, national origin, or religion. The scariest part? Its deemed illegal by the constitution. This leads to the question, why is this still an issue? If its illegal then why have celebrities like Chris Rock, Jay-Z and Obama (Yes, that Obama) faced this problem in their lives? 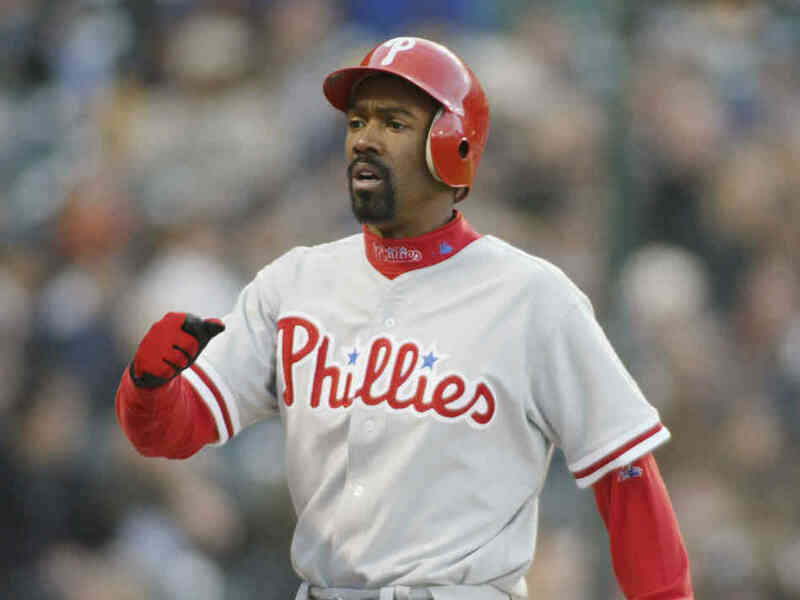 Why do cases like Michael Brown, Travyon Martin and Troy Davis raise their ugly head every now and then? To answer this question, we’ll have to look at the historical context of racial discrimination in general. Before the 20th century, people of color in Europe and America were in deplorable conditions. Their legal status was similar to that of any property item and it was no surprise that many were wrongfully accused of crimes in that era and summarily lynched by the government. In 1919, in response to a series of small-scale terrorist attacks perpetrated by German and Russian immigrants U.S. Attorney General A. Mitchell Palmer ordered raids that led to the arrest and summary deportation of more than 10,000 immigrants without trial. In Korematsu v. United States, the U.S. Supreme Court held that ethnic profiling is not unconstitutional and may be practiced in times of national emergency. The ruling defended the involuntary internment of an estimated 110,000 Japanese Americans on the sole basis of ethnicity and national origin during World War II. The latest chapter in the matter in question opened after 9/11 where despite the hope that America was entering a post-race era, the Patriot Act and subsequent public paranoia resulted in a whole new demographic being targeted. To reach a conclusion on racial profiling, its essential to know what its propagators argue. The foremost argument in its favor is that if people of a certain description are the most likely to commit certain crimes than it is more efficient and more economical to focus resources on that criteria. They also put forward the point that profiling isn’t inherently racist, if black people commit more crimes then they will be focused on and if white people commit more crimes then they will be targeted. In reality, the issue is much more complicated, it’s not possible to remove racism from the equation because what final conclusion does racial profiling produce that abject racism would not? The supposed definition of “racial profiling”—that the alleged behavior of any fragment of a population becomes the basis for categorizing it in its sum, that individual character can be determined by looking at a group collectively—is what was referred to not many years ago simply as racism. It can also be said that the police should not operate by already having a prejudice against a group, that the law should be colorblind, otherwise it can lead to problems like increased violence as law enforcement agencies, judicial systems and private citizens will have a ‘lower standard of evidence’ for people of other ethnic backgrounds and will be more likely to be aggressive against these groups. This notion can be backed up by the case of Amidou Diallo, an unarmed African immigrant who was killed in a hail of 41 bullets by the NYPD for attempting to show officers his driver’s license. However, despite all this some still argue that if we ignore the moral part of the argument, if implemented properly, why don’t we support racial profiling if it works? The answer is simple, because it doesn’t. 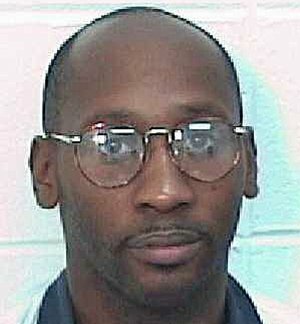 An ACLU lawsuit uncovered police data indicating that while 73 percent of suspects pulled over on I-95 between 1995 and 1997 were black, black suspects were no more likely to actually have drugs or illegal weapons in their cars than white suspects. 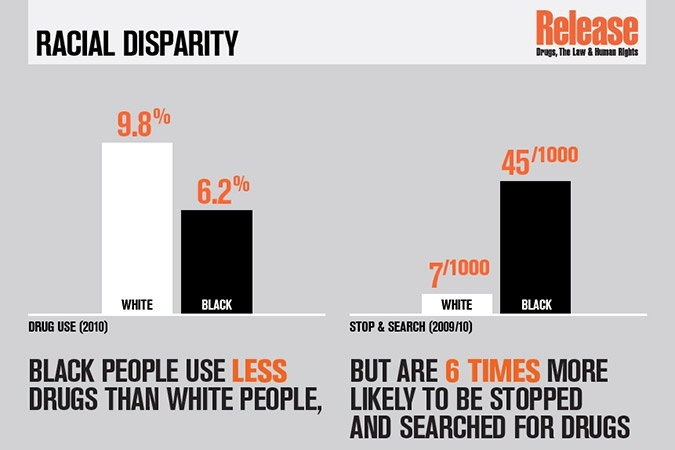 Therefore the effectiveness of searches, is reduced–not enhanced–by racial profiling. When racial profiling is used, officers end up wasting their limited time on innocent suspects. Now, linking this back to the title, racial profiling is a problem that doesn’t show any signs of disappearing and it can be seen as a catalyst in many problems that society faces today. When we subject people to humiliation and often frightening detentions, interrogations, and searches without evidence of criminal activity, we shouldn’t be surprised to receive a reaction. It has alienated communities from law enforcement, hindered community policing efforts, and caused law enforcement to lose credibility and trust among the people they are sworn to protect and serve. When a law enforcement agency practices racial profiling, it sends the message that whites are assumed to be law-abiding citizens while blacks and Latinos are assumed to be criminals. This shows us that with the world becoming increasingly paranoid, liberty-curtailing acts being enforced much more effectively than the federal bans on racial profiling which become more toothless day-by-day, the opportunity to take action is slipping. In the GOP debate this week, candidates Bobby Jindal and Lindsey Graham were eager to increase racial profiling when asked out about the incident in Texas. There’s good news as well as racial profiling has been shunned on various platforms. The 2003 Federal Ban by President Bush was strengthened by extended guidelines for law enforcement on how to handle issues pertaining to race by President Obama, abortive as the two measures are, they’re still a step in the right direction. With a landmark court decision in France earlier this year which condemned the government over police racial profiling during identity checks and the social media reaction to Ahmed Mohamed’s arrest, its visible that not everyone is willing to accept this as ‘necessary for national security’. 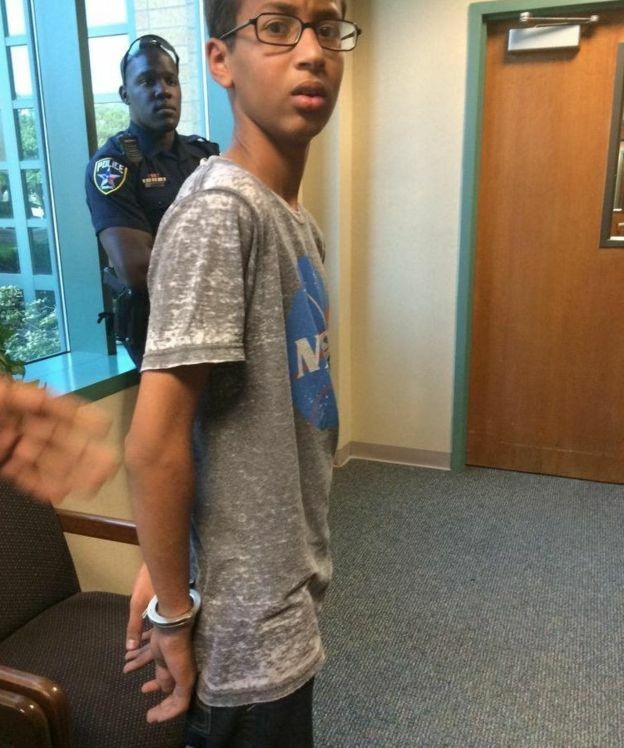 The moment Ahmed Mohamed was confronted about his invention, the administration realised that the device wasn’t a bomb, yet because of suspicions related to his race, they kept him detained for hours. 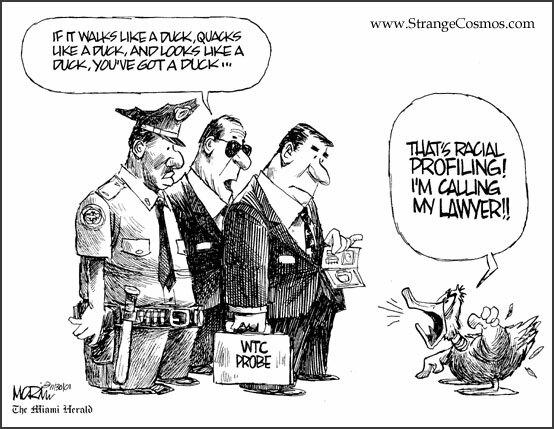 This is quite allegorical to how society treats racial profiling. We know it’s not real and doesn’t work but because of our paranoia, we haven’t rejected it. However, quite unlike Ahmed’s clock, the threat posed by racial profiling is quite real. Posted in World and tagged Ahmed Mohamed, ecolint, featured, la chat, newspaper, the update. Bookmark the permalink.